Verder's Hi-Clean pumps are CIP, SIP and strip cleanable. Verder's Hi-Clean diaphragm series of pumps consist of food grade and food safe polished diaphragm pumps, according to EC 1935/2004 & FDA and 3A. 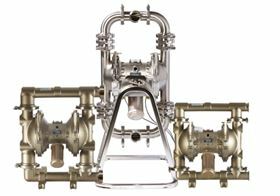 The pumps are available with Tri-Clamp or DIN 11851 connections, a series of high grade finished milk & dairy diaphragm pumps and a series of hygienic piston diaphragm pumps for the emptying of barrels. The Hi-Clean pumps are CIP, SIP and strip cleanable, are true self priming and are executed with overmolded diaphragms. Ball valve models (25 mm solids particles) and flap valve models (63.5 mm solids particles) available. Application areas are found in milk & dairy (cheese, yoghurt, milk), beverage (fruit, wine and beer), food (high viscous pastes) and personal care products (shampoo, hand & facial crèmes). Maximum flow is 568 l/min, maximum viscosity is 20,000 cP.